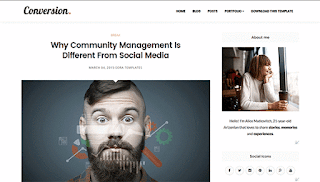 Conversion Blogger Template is a modern responsive blogger theme perfect for a personal blog or magazine. It is highly customisable with lot of featured and easy to use Theme Options. It’s highly customizable so it can match your personal taste and be quickly converted into a multi-purpose theme as well. Conversion Blogger Template support responsive layout so it looks great on all devices.